Clip Art and Black and White Set with 13 Color Images and 7 Black and White Images as shown in the preview. All images are high quality 300 dpi for beautiful printing results. 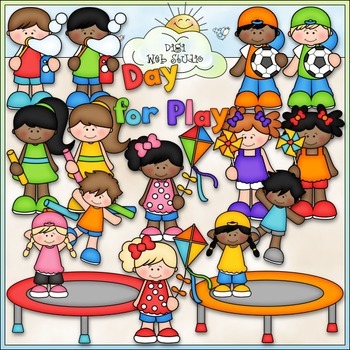 Includes: 1 boy and girl jumping on a trampoline (2 versions), 1 boy blowing bubbles (2 versions), 1 girl with colored chalk (2 versions), 1 boy with a soccer ball (2 versions), 1 girl flying a kite (2 versions), 1 girl with a pinwheel (2 versions), 1 word art of: DAY FOR PLAY.